Ovarian cancer is the fourth leading cause of cancer deaths in American women with about 22,000 diagnosed and 14,000 dying from the disease each year. About 75 percent of women with ovarian cancer are diagnosed with late-stage disease. Only 15-40 percent of women survive for five years after initial surgery that is performed to remove cancerous tissue from the abdominal cavity in combination with chemotherapy. While those statistics are frightening, it is even more vital to place them in context. A look at the most recent list of the top ten causes of death for all women reveals ovarian cancer nowhere near the top. Statistics can be helpful in assessing real risk, but the bottom line for many women is that ovarian cancer is a frightening disease because often by the time it is detected, the cancer is relatively widespread. Most women have heard stories of a friend or family member going in for a routine checkup only to find they have a mass in their pelvis and dying shortly thereafter. The media has catapulted devastating stories of both celebrities and everyday folks to front page news thus fueling the fears. Notables affected by ovarian cancer such as Gilda Radner, Loretta Scott King, and Dinah Shore have made coverage of ovarian cancer front and center in media channels, and , while it has created some undue anxiety, it has, more importantly, raised awareness for regular checkups and signs and symptoms. One of the major disadvantages in the fight to detect ovarian cancer early is the absence of an effective screening tool. Cervical cancer has been dramatically reduced due to the effectiveness of the Pap smear in identifying precursors of the disease which allow treatment long before the problem advances. Mammograms have increased the survivability of breast cancer by facilitating early detection thereby allowing treatment to ensue at the earliest of stages. Unfortunately there is no equivalent test for ovarian cancer. Currently doctors utilize a combination of ultrasound imaging and various blood tests to try to detect early cancers, but their utility is hampered by too many false positives and negatives. Research is ongoing to find a blood test or series of tests to help in the early detection of ovarian cancer, but that may still be years away. It’s also important to make a distinction between prevention and early detection. Preventative practices reduce a woman’s risk of ever developing the disease while early detection facilitates early treatment, but does nothing to prevent the onset. For example, long term use of oral contraceptives reduces the risk of developing ovarian cancer by approximately 50 percent. This can be an effective preventative tool in at risk women. Getting more advanced imaging tests (like an MRI) may be helpful in high risk women, but it is strictly related to early detection and does nothing as far as prevention. One of the best tools at a women’s disposal for assessing risk is family history. There is ample evidence that ovarian cancer runs in families, especially in those who carry certain genetic mutations. Some estimates say that up to 10% of ovarian cancers can be directly linked to such mutations, the most common being the BRCA 1 and 2. Doctors have become fairly aggressive in testing women with ovarian cancer and subsequently their family members for this gene variant as its presence warrants much more aggressive monitoring. Not everyone who has this gene will develop ovarian cancer; however, theyare at increased risk for this and other types like breast and colon. Other possible symptoms of ovarian cancer are abdominal bloating, gastrointestinal disorders, urinary symptoms, unusual vaginal bleeding (especially in the menopause), and unexplained fatigue. A word of caution: as you can see, almost all women will experience one or all of these symptoms at some time. Rarely is it due to cancer, so simply be aware and use any symptoms as a reason to get checked. A recent study indicates there may be an association between the fallopian tubes and ovarian cancer. There is evidence that some types of ovarian cancer may actually arise in the distal end of the fallopian tubes, which often encircle the ovary. Surgeons are much more aggressive now in removing fallopian tubes in hysterectomies to reduce the long term incidence of ovarian cancer. 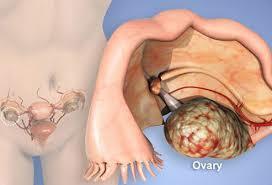 Treatment of ovarian cancer is largely dependent on the degree of spread. It often involves surgery followed by chemotherapy. Almost 90 percent of women who are diagnosed while the disease is still confined to the ovary (stage I) survive for five years.